Back in early 2006 when I reviewed the returns from my net worth in 2005 I realized I needed to spend some time looking at my asset allocation. 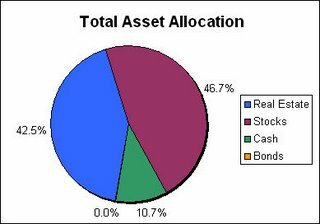 I took a look at my total asset allocation in March, but dropped the ball and didn't dig any further. Unfortuntely, my asset allocation has already changed enough that I should start over. 1) I bought a second property. 2) I vested in my cash balance pension plan, thereby adding bonds (or really bond equivalent investment to the mix). My pension plan earns a yield equivalent to 1 yr treasuries + 1%. 3) I have burned through a sizable amount cash this year. I actually think my asset allocation is better off today compared to March. I thought I wasn't exposed enough to real estate and given this is total assets (in the case of real estate ignoring the offsetting liabilities) then I think it make sense to have at least 1/2 your total assets in real estate assuming you have corresponding liabilities. Well, I knew it couldn't last forever. My fiancée has finally turned full speed on wedding planning. She had been distracted by other projects for at least a few weeks; however, she has suddenly decided we need to book a location NOW. What is interesting to me is how this is beginning to evolve. I can't even conceive how you can decide where you are getting married until you have a budget for the wedding. In my opinion, 1st things 1st - you don't want to book an expensive location, find out you have no money, and then can't afford the rest of the pieces of a wedding. I understand the urgency - we have tentatively targeted Fall, 2007 to get married and hence a need to secure a location before they book up. However I am treading on thin ice when I bring up costs. My fiancée’s parents have made some vague indications of providing my fiancée with a wedding that she wants. However, no budgets have been discussed, it seems to be stressing family members and its clear that we will be paying for at least a few parts of this wedding - how much is anyone's guess. It seems to me that it would make sense to just get everyone in a room and everyone say 'I am willing to contribute $X to the wedding' and we can begin planning from there. However, I have been advised by many people to just stay out of the way and let things play out. I'm just worried it could lead to a budgeting disaster..... anyone been down this road? I finally bit the bullet and have setup some permanent space for 2millionblog. Unlike many of my peers, I loved using blogger and had planned on continuing to use it for the foreseeable future. Unfortunately, I recently have just hit too many walls and felt like blogger was holding back this blog's development. I have migrated all the archives (posts and comments) over to 2millionblog.com. I will continue to dual post at both sites while I finish up the last of the migration work. Hopefully in the next few weeks it will all be complete and I can solely focus my energy on the new 2millionblog.com. I would like to invite you to update your bookmark and RSS feed to make sure you don't miss anything as I finish the move. The house I purchased in June has a gas pack heating/cooling system that was installed around 1993. I had it inspected while I was purchasing the property and a rust hole was discovered in the heat exchanger. I tried to negotiate for a whole new system from the seller, but in the end settled for ~$1,500 which was based on a quote I received to replace the heat exchanger in the gas pack since the unit seemed to be running fine otherwise and I was happy with the price we had agreed to. Well here it is a few months later and I am finally getting around to addressing this problem. I called the company who gave me the written estimate for $1,500 and (long story short) their new estimate is now $2,500 because the cost of the parts has jumped up. I called around and got a new estimate from a different company for $2,000. However every company I have called has suggested I replace the entire system since the repair cost is so high. 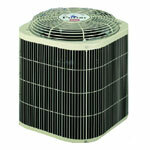 Further research online suggests the average lifespan of HVAC systems is 14-18 years. I am not sure if that is industry marketing suggesting that these systems need to be replaced more frequently? I have talked to colleagues and one said he had a system last 21 yrs before he replaced it. I got some quotes on new systems and they ranged from $4,700-$5,800 - way more than I really want to spend given my current cash crunch. I don't see much advantage to buying a new HVAC system in term of heating/cooling costs; yes they are more efficient, but I will not be living in the house long enough to see much payback - I plan to rent the house out in the next 1-2 yrs. On the other hand, a new system reduces the chance that I will have to spend time on the HVAC system anytime in the future. I looked into the energy efficiency tax credit and unfortunately the credits only apply to the upper-end HVAC systems and don't cover a significant portion of the increased price so I won't be taking advantage of them. So I am struggling to figure out what makes the most sense financially. If I bought a new HVAC system, the cost could be added to the basis of the property and deprecated over a 30yr period when I rent the house out. If I just repaired the system, I would not be able to deprecate anything. However, repairing the system has a much shorter payback period. If I repaired the system and it operated for the next 7 years, the new system would have to run at least 16.4+ years (assuming $4.7k cost for new) to reach the same level of payback. Given my current cash crunch and the shorter payback period, I am going to just get the system repair for now. When financial decisions like this don't have a clear cut answer to the biggest benefit, I always end up going the route that requires the smaller cash outlay. Well I bit again. Back in June I signed up for a 0% balance transfer from CitiCard for $26.5k, now I signed up for a $13k 0% balance transfer from Capital One. Since I no longer have any major financing moves in my immediate future (no plans to buy another property), I went ahead and put my credit score back to work by applying for a new credit card, taking the 0% balance transfer offer, and moving the cash to my HSBC Internet Savings Account to earn 5.05% APY. This time I used 2 different techniques to extract the balance transfer from the new credit card. When I applied for the credit card I requested a $10k balance transfer to my Wachovia Ready Reserve (basically a line of credit acct) account. Then I transferred the money from my reserve account to my checking account, and finally to my savings account. When I received the actual credit card, the mailing included a "purchase check" that could be used for balance transfers with no transaction fee. So I wrote the check to myself for the remaining credit, deposited the check into my checking account and then moved the cash to my savings account. For future reference, I found it less hassle to transfer using the purchase check so I will opt for using the check in the future rather than transferring it to my line of credit account. Last week, during a downpour, I had a fender bender. As I was slowing down, my car hydroplaned and I ended up hitting the guard rail. Luckily, no one else was involved and the car was drivable after the accident. My car hit the guardrail on the front drivers side. The rail missed my bumper (unfortunately) and crumpled the hood (not too much), the side panel was smashed around the park light, the headlight and park lights were smashed, and the engine compartment frame was bent in around the headlight. My first thought was to start looking into how much this was going to cost to get fixed asap. My head was hurting at the thought of probably spending $500-$1,000 (if I'm lucky) to get this repaired. Side note: I dropped everything but the liability insurance on the car since the value of the car was only $3-4,000. I knew I had an upcoming multi-hour evening trip in a few days that I needed the car fixed for so I wouldn't get a ticket for not having a headlight. I also have been feeling the pinch of spending more than I have been making for the last couple months (cash-wise) and really wanted to keep my expenses to an absolute minimum. I slept on this and decided I was going to MacGyver the car to help me keep my current expenses to a minimum. I went to Walmart and bought a roll of duct tape ($2.12) and a headlight bulb ($9.83). I also picked up a pair of pliers from Target ($1.25, clearance) since I am away on temporary assignment and left all my tools in NC. I came back and pried out as many of the headlight case pieces as I could from the smashed in area around the front of the car. I reconstructed the headlight as best I could, I felt like I was on a dinosaur excavation. 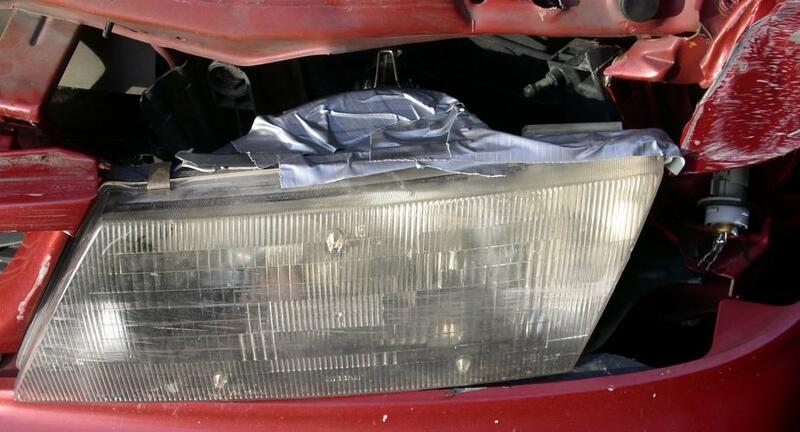 I used the duct tape to put the pieces back together and then popped the new light bulb back in the headlight. I worked the reconstructed headlight back into the car as best I could and wedged it minimize the risk of it popping out. While it is not a permanent solution - this was good enough to get the car back on the road till I could spend the right amount of time formulating my plan to make permanent repairs to the car. What a month! Investments faired well, I vested in my pension, and I made the most frivolous purchase of my lifetime as a sign of commitment to my fiancee. In the end I added $18,689 to my net worth ($1,261 excluding my vested pension adjustment). I have modified the "401k" asset line item on my net worth statement to "Pre-tax Retirement Accounts" to include both my 401(k) and cash balance pension value. I bought an engagement ring (part 1, part 2) which took a serious hit to my net worth, but was negated by my pension vesting. I vested in my pension adding $17,406 to my pre-tax retirement accounts. I experienced another strong month in my taxable brokerage accounts, mostly from a rise in my Pfizer and Merck investments. I bought the last of the airline tickets for my temporary assignment; I hope for the rest of the year my monthly expenses will be more inline with the 1st half of the year. I am now officially cash poor. I have purchased a new property and an engagement ring in the past couple of months and my focus for the rest of the year will be to retain as much cash as possible. I have challenged myself by spending so much cash this year; if I can get through the next year (read wedding expenses) and build some cash to replace my emergency fund I will be very happy. I recognize that building my cash position for future opportunities will be a gigantic challenge. I plan to discuss this more in future posts. Wow - time flies - It was one year ago this week that I published my first post that started 2millionblog! What a ride it has been so far. I have learned so much from my efforts to keep this blog running; it has truly been a great experience. To reminisce a bit, here are 12 topics I picked out from each month I have been running this blog - enjoy! In August 2005 I confessed my bad (but mostly profitable) habit of wagering on college football games. In September 2005 I created a 3 part series on my investment hedging of future energy prices, Part 1, Part 2, Part 3. In October 2005 I created a guide the lowest cost plan when investing in some individual stocks using either Sharebuilder or the company's DRIP. In November 2005 I exposed to the world the miracles of beer rebates. In December 2005 I purchased the car parts myself and had a mechanic install them to save on repair costs. In January 2006 I calculated my 2005 passive income to be $1,990.51. In February 2006 I figured my total return from my net worth in 2005 was a measly $2,045, Part 1, Part 2, Part 3, Part 4, Part 5, Part 6, Part 7. In March 2006 I had to establish what the cost basis was for my rental property and segment the depreciation in the most profitable manner. In April 2006 I finally tossed Etrade and transferred my brokerage assets to Sharebuilder. In May 2006 I started planning for a temporary assignment in NY. In June 2006 I purchased a new property and shared the step by step negotiations that took place between myself and the seller. In July 2006 I detailed my tips for shopping for airfare as I booked several weekend trips back home during my NY assignment.